Last issue, I introduced my approach to two-way shots. I explained lower-percentage shots where you can make the intended object ball and gain position for the next shot, but also play safe in the event the object ball doesn't go in. There are also two-way shots that don't involve making the lowest numbered ball, but making another ball and playing safe if you miss. 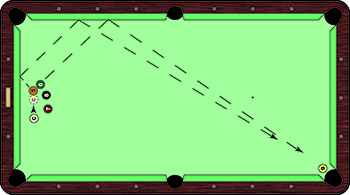 In the diagram, the 9 is hanging in the corner pocket and I have no real opportunity to pocket the 5. You actually have two chances of making the 9 ball on this shot, while still keeping the cue ball trapped behind the 8. I'm not worried about the next shot. This is strictly a safety shot first, with the added bonus of possibly making the 9. You don't have to worry about making the 5 or 6 and being hooked, because the only ball that could go in here is the 9. The only thing I might do differently here is hit this shot harder than normal. If I hit the shot with pocket speed and the 5 reaches the 9 but doesn't knock it in, I may leave an easy kick to the 5-9. I want the 5 to move away from the 9 if it doesn't go in, so I use "just-in-case" speed. One thing about two-way shots: don't try to change your shot once you're down. People will get down over the shot and then try to make adjustments in an effort to make both shots. Make your decisions before you get over the shot. Concentrate on making the first ball.